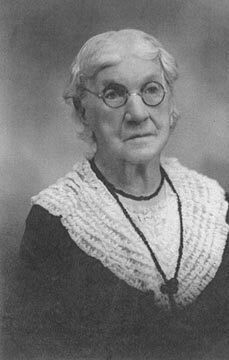 Helen was born July 24, 1841 in Pond Mills (present site of London, Ontario), the tenth of thirteen children to John and Janet "Murray" Farris. Although her parents immigrated to New Brunswick in 1818 from the borderlands of Scotland, the family moved west in 1832 to Pond Mills, Upper Canada. Helen was raised in a strict Presbyterian home and remained a devout follower. She attended Pond Mills school where her uncle, Adam Murray, was the teacher. In addition to the "Three Rs" (reading, writing, arithmetic), the curriculum included memorization of Bible verses. In 1934, she wrote, "I can still repeat seventy-five to eighty of the psalms I learned in school." The twenty-third psalm, "The Lord is my shepherd; I shall not want," was one of her favourites. Sunday church services were rarely missed for one hundred years. Helen did, indeed, practise her Christian ethic. At Pond Mills on September 5, 1865, Helen married Thomas Willows, who was to be her soul mate for over sixty-one years. They settled nearby where Thomas operated a water-powered grist mill. Here, their children, Harvey, Jeanette, Jim and John were born. Having a zest for frontier adventure, the family moved to the recently "opened up" state of Nebraska in 1872, settling near Omaha. They "took up" land (homestead lands) and operated the J.F. Roll Mill for twenty years. Helen became deeply involved. Wherever there was a need, Helen was there to offer her time and talents, whether nursing the sick and dying, delivering babies, organizing church functions, or actively helping her husband. "Thanks to the Giver of all gifts, I am up and about again, hard work never hurts anyone." While in Nebraska, Helen was called "Mother of the Prairie." One of her responsibilities was to look after and find homes for orphans. She comments in a letter, "I used to receive nice letters from them and that does my old heart good, and that is the best pay." Because of Helen's concern for the welfare of children, Helen and Tom adopted Anna, an orphaned two year old girl in 1884. Two years later, red-headed twins Virgil and Leslie Williams (fifteen month old babies of Thomas' dead sister) came to live with them. Helen was forty-three years old when she took up this challenge and dedicated herself to raise these children, not a task for an idle woman. She commented in a letter to her cousin, "It was hard on me with the three small children." Helen's motto was, "Depends on how you raise children as to how they turn out." Her grandchildren remembered Helen as a disciplinarian, but that she asked no more of them than she demanded of herself. She loved and encouraged young people, and enjoyed seeing them succeed. In 1892, with the Canadian Pacific Railway opening up the Northwest Territories, Tom and Helen, and their son Johnny took up homestead lands west of Wetaskiwin, two miles from the Indian reserve. Helen had a wonderful capacity for making friends, and soon gained the confidence of the Indian people. They were Helen's staunch allies, and remained so after the Willows moved into Wetaskiwin. Whenever the Indians came to visit, they were made welcome with tea, homemade bread and butter, and treats served on her best china. Helen, again, found herself being called upon to nurse the sick and deliver babies. She even baptized a dying baby to ease the frantic parents. Helen and Thomas bought a five acre parcel of land on Thusis Street (now 45th Avenue). Wetaskiwin's first jail was moved onto the Willows' lot, and renovated into a comfortable home. They had a large garden of berries, vegetables and flowers, as well as a cow and driving horses. A row of spruce trees was planted along 45th Avenue and up the front gate to the house. In 1908, they purchased two lots on Lorne Street (now 51st Avenue) and built a cottage. Six of Helen and Tom's children lived in Wetaskiwin for periods of time: Harvey was the local butcher, Jeanette Dodson and her husband Clarence farmed in the Brightview district, Johnny owned the stationery store and built the first indoor skating rink lit with lanterns as music played on a gramophone using conical discs, and Anna, Virgil and Leslie attended school. Son Jim owned a farm in the Ferintosh-Dorenlee area. Helen became a tireless worker for the Methodist Church. One story tells about an organ that had been purchased, but the little congregation were unable to meet the payments. Helen offered to "lift the mortgage". She organized a community sports day to coincide with the day the Indians got their Treaty money. Helen baked tubs full of buns, bought a few lemons and a lot of citric acid. The sliced lemons were left floating on top of the lemonade all day, and water, sugar, and citric acid were added freely. The little booth did a roaring trade. By the end of the day, the organ was paid for and there was money in the treasury. Helen was a competent seamstress. At nineteen years of age, Helen helped her sister make a dress; the embroidery on the skirt took approximately two years to complete. This stunning creation was worn at the ball when Prince Edward VII visited London, Ontario. Doing handiwork was a favourite pastime. Helen took raw wool from sheep, washed, carded and spun it into wool. Throughout the years she knitted socks, sweaters, children's dresses, and mitts for family, friends and various craft fairs. Another labour of love was hand-quilting comforters. Helen was still knitting and crocheting at age ninety-two and beyond, until her eyesight prevented her from doing so. A great granddaughter is fortunate to have a piece of Helen's handiwork: a round cut-work linen tablecloth edged with crocheting. In 1916, due to Thomas' poor health, they moved to Dorenlee to live near their son, Jim. Thomas died in 1926. Helen continued to live there until 1934 when she moved to Calgary with her daughter Jeanette. She was still attending and actively involved in Ladies' Aid meetings in 1938. In 1937, her love of family, friends and adventure was still evident. Helen continued to portray her self-confidence at the ripe age of ninety-six when she travelled alone by train from Calgary to visit her dear old friends in Wetaskiwin, her namesake grandchild in Edmonton, and her son Jim at Dorenlee. She was blind in one eye by this time, though she claimed that was only a mere inconvenience. On July 24, 1939, family and friends gathered at St. George's Island in Calgary to celebrate her ninety-eighth birthday. Five generations were present. There was a write-up and picture in the Calgary herald. Congratulations arrived from the King and other dignitaries on her one hundredth birthday. Helen continued to be interested in people, the news, and reminiscing about her experiences until gallstones caused her death in Calgary on March 30, 1942, at the age of one hundred years and eight months. She was buried in the Dorenlee, Alberta cemetery.